Powered by Yggdrasil Gaming, The Royal Family is a 5 reel, 25 payline video slot that comes with free spins with plenty of other goodies including wilds and multipliers of up to 4x. Play this regal-themed game on all devices from between 10p and £200 per spin. 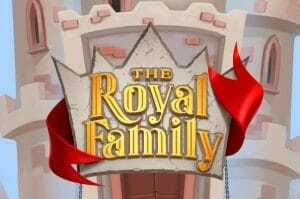 There’s never usually any concern when it comes to the design of an Yggdrasil Gaming title and The Royal Family is another lovely looking game. With a fairytale castle in the background, you’ll see lower value playing card suit symbols spinning around the reels. They’re joined by 4 members of the royal household. The best of these offers 10 times your bet if you land 5 in combination. Helping to create the winners is the smiling jester who is wild. Free Spins feature – land 3, 4 or 5 of the trophy scatter anywhere on the same spin and you’ll be awarded 8, 16 or 24 free spins. During this round, any of the members of the royal household can turn into wilds. Feature Prizes – underneath each reel you’ll see a banner with room for 2 Feature Prize symbols. When the 2 spaces under any reel are filled, you’ll trigger the Free Spins feature with 8 free spins. These come with the Feature Prizes on the banner. The Royal Chest feature – the Royal Chest symbol appears on reel 5 only. When it hits in the base game, you’ll be offered a selection of 5 golden playing cards. Pick 1 to reveal a coin win (which can be anything from 10 to 250 times your bet or access to the Free Spins feature with 8, 16 or 24 free spins. Trigger the Treasure Chest in the Free Spins feature and you’ll also pick from 5 cards. This time they’ll award 2, 3 or 4 additional free spins or 1, 2 or 3 sticky wilds. There’s plenty to like about The Royal Family. The cartoon style visuals are terrific and the soundtrack is superb. If you like a good range of extras, then you won’t be disappointed either. We found them quite tricky to land though and the variance is on the high side of medium. You can win nearly 2,000 times your bet on each free spin with a 4x multiplier. Even if you’re not an ardent royal watcher, the combination of classy design and features makes this audience with The Royal Family well worth making. I highly suggest you try other superb Yggdrasil Gaming titles with Lucha Maniacs and Vikings Go Berzerk 2 of my favourites.